Below is a list frequently asked questions divided into sections. For answers to questions that interest you, please click on the section name. Cheque: You can pay with cheque, by mailing it to: Canvas Method, 1710 Victoria drive, Vancouver, BC, V5N 4J8. Please pay to the order of Justin Ogilvie (not Canvas Method). Please mail the cheque with a note including your full name and email address clearly printed. Cash: If bringing cash, please bring the exact amount in an envelope to Canvas Method at 2061 Yukon Street. Please deliver the cash up to 15 minutes after the end of any class. Please see Schedule for class hours and Contact for a map of our location. Upon receipt of payment with cheque or cash, we will email you with your login information so you will be able to book your classes. 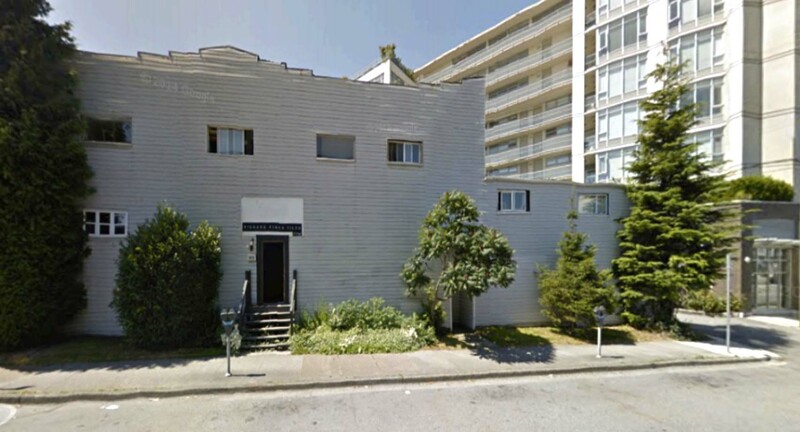 We are located at 2061 Yukon Street, Vancouver, BC, V5Y 3P1. Please see the map below, or click here for the Google map location. Yukon St. is one block east of Cambie St. The intersection is approximately 4th Ave. and Yukon St.
There’s a Starbucks on the corner of 4th Ave. & Yukon; the studio is located in the back alley behind Starbucks. In this back alley, there are two red doors. We are the middle one up the small flight of stairs. The studio is located in a back alley, which our door opens onto, so you can always drop off materials before parking if that helps. free parking: On 4th Ave, there are many free parking locations that will be fairly easy to find in the evenings. 1-hour parking: Throughout the area, there are many 1-hour parking spots sprinkled about. Parking becomes free after 6pm for each of these 1-hour spots, so you can park there anytime after 5pm. paid parking: Everything east of Yukon St. is $1/hour, while everything west of Yukon is $2/hour. by skytrain: Take the Canada line (the line that connects Richmond and the airport to Vancouver) to Olympic village station. When you get out of the station, immediately turn left, walk under the bridge and then cross Cambie street. Then turn right and cross West 2nd ave. You will see a police station in red brick at the corner, walk to the left of the police building, down West 5th Ave. Turn left down the first alleyway off of West 5th Ave. The school is the red door on the right with the small staircase which halfway down the alley, just past the blue dumpster. You will see the ‘Canvas Method’ emblem on the door. Take the 84 UBC bus to Olympic Village Station. Immediately turn right and walk under the Cambie street bridge and cross the street. 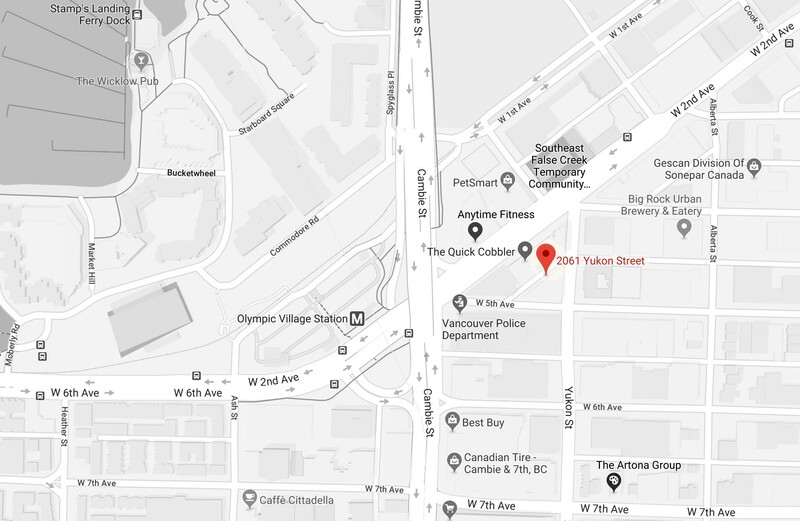 Then turn right and cross West 2nd ave. You will see a police station in at the corner, walk to the left of the police building, down West 5th Ave.
Take the 84 VCC-Clark Station to Olympic Village Station. Cross Cambie St. and you will see a Police Station on your right, turn right down West 5th Ave. and then turn left into the first alleyway on West 5th Ave. You will see a police station in at the corner, walk to the left of the police building, down West 5th Ave. Please click CONTACT at the top of the website and fill out the form. Canvas Method offers a broad range of learning experiences, including classes, workshops, demonstrations and lectures. Classes: These are ongoing core classes open to all levels, with a maximum of 12 students. Instruction is catered to each individual’s needs. Classes are scheduled in four week cycles; two weeks working from life (live model / still life), one week working from copy (photographic sources / master copies), and one week with an in-depth instructor demonstration. Please see course descriptions here to register or for more information. workshops: These are one and two-day courses addressing specific themes and techniques typically held once a month, with a maximum of 12 students. Please see workshop descriptions HERE to register or for more information. DemonstrationS: These painting and drawing demonstrations are open to the public, social in nature and typically held on Friday nights. Please see upcoming demonstrations here to register and for more information. Lectures: These lectures are open to the public and typically held on Friday nights. The lectures cover a range of topics including ‘Anatomy’ with Justin Ogilvie, as well as other topics by guest artists, curators, and art historians. Please see upcoming lectures here to register and for more information. open Critiques: These sessions are open to the public, facilitated by an instructor. Attendees can expect a formal analysis of their work, where they gain insight into a variety of art making processes and concepts. Classes: These are ongoing core classes that repeat every week. WORKSHOPS: These are concentrated one and two-day courses that are offered typically on weekends. Please visit our registration page here to purchase a Flex or Unlimited package, or a workshop or special event. Please see below for more information on our packages and other offerings. flex tickets [Single class, 5 classes, 10 classes, 15 classes]: After registering here, you will be asked set up your login information. You will then be taken to our booking page, where you can pre-book classes. Your seat is confirmed once you have pre-booked a class. We encourage you to book 1-2 weeks in advance, as seats fill up quickly. If the class is full, you are encouraged to choose another class for that week, or to join the wait list. Unlimited Classes: After registering here, you will be asked set up your login information. You will then be taken to our booking page, where you can pre-book classes. Your seat is confirmed once you have pre-booked a class. We encourage you to book 1-2 weeks in advance, as seats fill up quickly. If the class is full, you are encouraged to choose another class for that week, or to join the wait list. Workshops: After registering in a workshop here, you are guaranteed a seat. If the workshop is full, you will be placed on a wait list. Anatomy Lecture Series / demonstrations / open critiques / special events: To receive information on upcoming lectures, demos, critiques and special events, please join our Mailing List at the bottom of the page. Yes, you can pay for a single session here. Classes: Please see the registration page here. Three hour classes cost between $50 to $65 CAD, depending on which package you choose. workshops: Priced on an individual basis. Please see the workshop information here. Canvas Method is set up as a contemporary atelier, consisting of core classes, which are broken up into 3 terms: Fall, Winter and Summer, with small breaks in between. Each term consists of 15 weeks of classes. The program is ongoing (with no beginning or end), so students are able to sign up for classes at any time. This is an open-ended program. There is no end to mastering the technical fundamentals. Creative expression and thinking conceptually about your work is also a lifelong journey. We at Canvas Method offer a home for those who want to live within an artistic life. Since progress is directly related to effort, students are encouraged to attend classes regularly, so that they may progress quickly and enjoy tangible results within their artwork. All levels are welcome. You will receive one-on-one instruction, catered to your specific needs. We have a maximum class size of 12 students. Classes: There is a minimum class size for classes. You will receive 3 days notice if the class is cancelled, due to minimum class size not being met. workshops: There is a minimum class size for workshops. You will receive 3 days notice if the workshop is cancelled, due to minimum class size not being met. Seats are limited to 25 and fill quickly, so you are encouraged to sign up early. We are not an accredited educational institution at this time. Class times can be found on the schedule here. Typical class times are morning (10AM-1PM), afternoon (2:30-5:30PM) and evening (6:30-9:30PM). Students are arranged in a semi-circular format. Each student is provided with their own easel, glass palette, side table and stool or chair. You will need to bring your own material. Please see the materials list for each class under course descriptions. Please see the materials list for your specific class / workshop under course descriptions. so you have ample time to set up. You are encouraged to speak to the instructor during class time. You are welcome to listen to your own music, although we recommend that you listen to the instructor, as they move from student to student, so you can absorb information throughout the class. A storage cubby that is 13” x 13” x 15” deep, ideal for brushes, paints, pencils, etc. A canvas rack that fits approximately 3-5 canvases or panels. Storage is included for students with a valid ‘unlimited classes’ pass. Please see here for more information. Otherwise, storage is available for $20 per month, which can be purchased during checkout, or on the 'store' page in your personal account. We encourage repeat students to rent storage space, as transporting wet oil paintings and art supplies is inconvenient and (potentially) messy! We have an area to hang your coat and place your bag. We have a small fridge to store your food during class. Please do not store your food / beverages in the fridge overnight, as there is limited space. You can also use the microwave and electric kettle. Please keep areas clean for other students. We have cups and filtered water for student use, but no cutlery. Please remember to wash your dishes at the end of class. You are welcome to eat at the studio during break times only. Please only bring odorless mineral spirits or gamsol. Turpentine and other 'fumey' solvents are not allowed. During class times, please remember to keep lids on top of solvents. Fumey mediums such as Liquin are not allowed. We allow mediums such as walnut based mediums, gamblin solvent free medium, linseed and other non-fumey products. We go to great efforts to keep a non-fumey, clean air environment by opening windows, using fans, and always covering solvents. We store lost and found items at the school for up to 3 months. Any items not claimed within that time period will be donated to charity. We are in a gentrified area, near a police station with many storefronts nearby. Figurative classes generally consist of 4-week cycles: 2 weeks working from the live model, 1 week working from photographic sources / master copies, and 1 week with a 3-hour instructor demonstration. Non-figurative classes do not use the live model. Working from Life: This includes working from live models, still-life setups, and plein air landscape. This is a time-tested approach to train the artist’s eye in achieving accurate proportion, color, and value. Being close to your subject increases your sensitivity, bringing life, spontaneity and realism into your work. Working from Photographic Source: This is an effective resource to focus on developing high-level realism, as you work from well-lit imagery, with close-up details in extraordinary compositions. Learning how to work with photographic source material is a vitally important aspect of being an artist today. Working from Master Copy: This is how you learn most directly from the Masters. This is the most efficient way to learn and integrate invaluable techniques into your own process. You can expect to learn a wide range of drawing and painting approaches of master artists, including composition, color palettes and brushwork. In the school we have a large selection of full-color reproductions of both paintings & drawings, carefully selected from a wide range of master artists. Whether you’re a beginner or advanced level artist, copying a master painting / drawing is a time-tested method for learning techniques. The instructor will take you step-by-step through the process of that particular artist. Yes, you are welcome to bring your own printed photos, or work from a tablet or laptop. Please remember to bring your charger. Each student will receive a portion of the class time to receive feedback on their choice of class work or personal work. For registering for single, 5-, 10-, or 15-class packages, your seats are valid for a 12 month period. Unlimited class packages are valid for 31 days, beginning on the day of your first booked class. Workshops, special events, etc. are valid for the time of the event. Classes: Refunds are not available unless a class is cancelled by the instructor. In this case, you will receive credit towards a future class. WORKSHOPS: Refunds for workshops are available, but only if the class is cancelled by instructor, or due to minimum class size not being met. Credit for classes missed is not available. Please contact us here here to let us know. Classes: Students are encouraged to register online one to two weeks before the class. If a class is full, the online registration page will show no available seats [full] and you can book a class for another day or time. workshops: Students are encouraged to register early, as workshops fill up quickly. If a workshop is full, you can still register to be placed on a wait-list. A seat will be offered to you, if and when a seat becomes available. drawing: We will open the door 15 minutes before class. painting: We will open the door 30 minutes before class. drawing: You will have 15 minutes after class to clean up. painting: You will have 30 minutes after class to clean up. Please contact us here to set up an appointment. There are no age restrictions for our classes. However, with life drawing / painting classes, parental consent is required for students under 18 years old. Instruction will be in English, so a basic conversational knowledge of English is required. Our school is not eligible for student visas at this time. Please speak to your instructor for help. Please go to CONTACT at the top of the page and fill out the form with your questions.